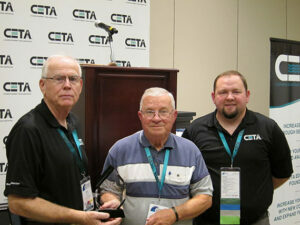 The Cleaning Equipment Trade Association (CETA) established the Lifetime Achievement Award in 1995 to recognize those who have achieved excellence in the Pressure Cleaning Industry and to honor those who have made significant contributions. Nominee must have made a significant contribution to the industry and will continue to distinguish their work in the improvement of our industry. The prestigious CETA Life Time Achievement Award honors an individual or individuals who have made significant contributions to the pressure cleaning industry. The CETA Board of Directors is pleased to present this year’s honorees with this award for their many achievements and contributions to the Pressure Cleaning Industry. Please contact Awards Chair, CETA, with suggested nominations and requests for information at info@ceta.org. Marlo graduated from Hillcrest High School in 1970 and immediately left for Fort Leonard Wood Missouri to serve as a Combat Engineer in the United States Army. After completing his Army training, he attended college on a full ride athletic scholarship in football and track. In 1976, Marlo graduated from Utah State University with a Bachelor of Science in Microbiology and Chemistry. This is the where he met his wife Marcee. Marlo and Marcee moved from Logan, Utah to Portland, Oregon for Marlo to complete his Doctorate Degree. In 1977, he met Larry Linton who was a friend of his father-in-law. Larry offered him a part time job working with pressure washers. He was told by Larry Linton that the most important thing was to study and get good grades. He had Marlo sit at his desk to study and then help customers when needed. Realizing that Larry was being kind to a poor college student, Marlo felt a need to earn his pay and started to look for jobs that needed to be completed. He started by repairing Hypro and Sundstrand pumps and rental pressure washer equipment. His first exposure to pressure washers was with brands like Malsbury, Delco, L&A, Citation, Simpson, Coleman and other brands. After receiving his Doctorate degree in 1979 he was offered a management position for Landa, a new pressure washer manufacturing company. He remained on the Landa Executive Management Team until 1999 when it was sold to Harbor group who merged several other pressure washer companies such as Rhino, Tuff, Shark, and Hotsy under the company name C-Tech. Later C-Tech was sold to Karcher which is the company in where Marlo holds the position of Sr. Manager today. Marlo always had a desire to be active and involved in the industry in which he was employed. He served on the CETA Technical Committee in 2005. Marlo has stayed very involved with CETA through the years, serving on the Executive Board. 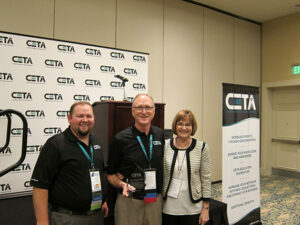 He was awarded the CETA Distinguished Service Award in 2012. He was associated with the Advisory Committee for the formation of the first pressure washer industry safety standard UL 1776 in 1992.He joined the CETA Board of Directors in 2008 and was assigned the chair of the Technical Committee. During this time, he lobbied for a “Power Pressure Washers” category with the Governing Board of the South Coast Air Quality District amending Rule 1147 requiring a permit to operate a Power Washer placing this new category under the eighteenth amendment of Rule 219 subdivision (b)(4) for an exemption. In addition to his role at Karcher and CETA, Marlo is also heavily involved in his community. He served as Chair of the CCI, Chair of the Budget Committee, and was elected to the city council. He served on the PECO Board of Directors for a choir and orchestra group that performs every year at a Trail Blazer game and various charity fund raisers such as Doernbecher Children’s Hospital. He serves as Director of Community Outreach, Community Partnership Team Leader State of Oregon, Clackamas County CCI advisory committee and several church leadership positions. Marlo is honored to be part of CETA which remains a key link and support tool for both distributors and manufacturers alike, helping the pressure washer industry continue to grow! A lifetime of pioneering, dedication, commitment, and service to the Power Cleaning Equipment Industry. Roger Walz fulfills all those requirements and more. Roger recently began his forty-fourth year at Alkota Cleaning Systems, Inc. (starting in 1974.) He also was employed by Electro-Magic, Inc., when it was located in Vermilion, SD. He worked there for 10 years in production and engineering positions. Roger supervises the Engineering Department at Alkota. And has been in the industry for Fifty-four years. Even more important than the years of working in the industry is the impact that Roger Walz has had on this industry. That impact goes beyond the cleaning equipment he has helped develop to helping vendors, other manufacturers and distributors. His impact has been to continually improve the product and the way it is manufactured. It goes to the cleaning equipment distributors who he has helped train and educate. His influence can be seen in every U.S. manufacturer’s product today. His dedication and commitment to everyone in the industry is exemplary. An example which is certainly not all inclusive but indicates the type of person Roger is and why his peers at Alkota feel so glad to work with him: In the early days of the twelve-volt burner, the twelve-volt igniter was the weakness in the system. Burner manufacturers could not make the life of the ignitor acceptable to the industry. Instead of recommending the use of generators in the system Roger contacted an electronics company, Custom Coils, to try and improve the twelve-volt ignitor. That supplier, Custom Coils, under Roger’s direction, developed an ignitor that had an acceptable life. Roger Walz helped develop and test that igniter. Wayne Combustion Systems supplies the twelve-volt ignitor today. I believe it is still Custom Coils. Both Wayne Combustion and Beckett Burners have used thousands of these ignitors in the last few years. This is all because of Roger’s dedication and commitment to a product. Roger has served on the Technical Committee for CETA and has helped our entire industry be more user and environmentally friendly. Roger was born and raised in South Dakota where he served as Mayor of Alcester for a time. Roger is married to Avis Walz they have 3 children: Tim, Jeff and Mark; 5 Grandchildren, 4 boys and 1 girl. He is a member of the Lutheran Church. 2000 Dwayne & Gale Whitmire Whitco, Inc.
2001 Michael Christopherson General Pump Inc.
2011 Bob Farley Farley’s Inc.
2013 Roy & Linda Chappell Chappell Supply & Equipment Co.
John Sr & Brenda Purswell Alklean Industries, Inc.
2015 Ralph A. Notch AR North America, Inc.
1997 ORIX Credit Alliance Inc.
1998 Tom Martin Elite Manufacturing Corp.
2007 R. Calvin Rasmussen Royce Industries, L.C.